So I’ve started to bring my drawing tablet to school. It’s awesome to make my projector kind of into an interactive-type thing. I’ve been able to emphasize things, draw images, and take notes with the kids. But I’ve also used it for a bit of fun. At the end of the day I have a study hall so while they were coming into class I made this little guy. They said it looked like a lizard…which I suppose it does. 🙂 But I hope it scared them into doing their work. rawr. 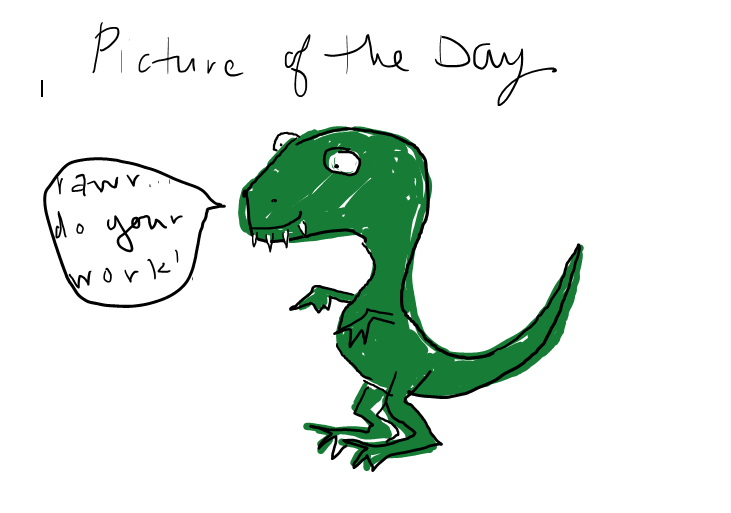 I love this very-obviously-a-ferocious-T-Rex dinosaur. In fact, I want you to make it into a magnet — just the dino and a word bubble with “RAWR…do your work” –, so we all can buy one and use it to remind us to get back to work. I also want a mug with the same. In fact, I probably want a mug more than a magnet, because a magnet and a laptop don’t usually mix very well. Oh, and also a mug with Smudge on it. Of course. Seriously. Why thank you! 🙂 I haven’t really gotten a request for items with my drawings…but if you really are interested email me (notacrzycatlady@gmail.com) and maybe we can figure something out.